I enjoyed teaching at the second school. It often stressed me out, but for the most part I held it together. There were days that I was depressed and it was really hard to go to work. I was on autopilot. There were other days that I was able to use my hypo manic energy to add great things to my lesson plans. It was at this school that I had an evening class to teach some of our parents English. During this time, I started “dating” a guy who I worked with. Yes-We slept together, but I learned later that it didn’t mean as much to him as it did to me. It was nice to spend time together. We event took a trip together. There was a time that I got sick. I think I was physically sick as well as mentally sick. Like I have said before, so many things blur together. However, I don’t think this time I was ever hospitalized. It was during this time, this guy and I had planned to do something and he did not show up. I called him several times and he did not answer. I started to become worried. So, I called a friend. We went over there together. His front door was opened. I am not sure why, but I went in. I found him hunched over in the closet hiding from me. Either he was scared of me or just plainly did not want to be involved any more. It did not matter, I moved on and so did he. I never really got a chance to explain my actions leading up to that point. I think he knew I had bipolar disorder, but had never seen me like that. It was hard to keep working with him after that, but we did. I don’t think what he did was necessarily wrong as I probably would have been scared too if I was acting as strangely as I do sometimes. I do think he should have answered the phone just to let me know that he was ok.
During this time, I had a guy friend who really liked me. We had fun together, but I was never attracted to him. I knew him before I started teaching about four years before. I met his parents and yes, once again, I did sleep with him. I regret sleeping with him and all the others along the way. 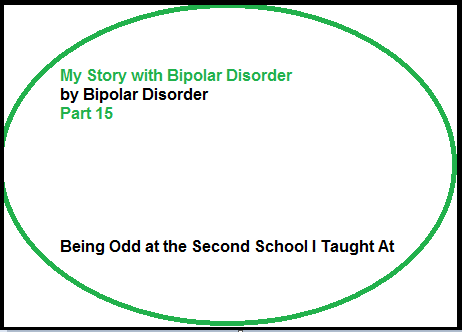 I know that if I did not have bipolar disorder, I would not have been doing these things. There was a time when I was in the hospital. I was sleeping with the first guy and the second guy who I wan’t interested in other than friends and at this point was not sleeping with. The first guy was in the ER with me. He was supposed to drive me home. Instead, he just left. The second guy was nice enough to come and get me and drive me home. I am not sure why he was so nice to me. I did use him and really fell badly about this to this day. For the most part, everything I did at the school professionally was great. I believe I was a good teacher and taught my students a lot. There test scores showed it. The stress did impact me, but I was able to get through the days. I would sometimes yell at the kids. I always felt badly afterwards and would tell them that. Many times, the kids would say things like that is ok, we deserved it. I don’t agree, but at the time, it made me feel a little better. That year I had a student who was really a challenge. She would annoy the other students. She had major issues that I think started at home. She would sometimes just get mad at me or another student and run out of the room. I would have to call the office so someone could go look for her. Another student, who had ADDHD, struggled in my class. He was a good kid and very intelligent, but often was disruptive to other students. His parents did not want to put him on meds and I respected that. I had him the first year I was there. The end of the second year I was there, he was in another class. Because I was manic, I called them and told them that I had bipolar disorder and could relate to him having a mental illness. Of course, they called my principal and that did not go over very well. I chose to go to another school. I did not have to, but felt that that school was just not for me anymore. What came next was the best part of my career. 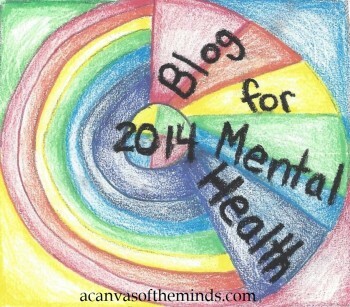 This entry was posted in Uncategorized and tagged bipolar, bipolar disorder, depressed, depression, manic, manic episode, teaching. Bookmark the permalink.